Vern Burkhardt (VB): Are conventional thinkers almost certain to come up with a solution that is second best to an integrative thinker's resolution of a problem or business challenge? Roger Martin: Conventional thinkers will more freely accept trade-offs so they tend to come up with second-best solutions. An integrative thinker will attempt to think about alternatives and not accept any one of them. Given A and B as options, the conventional thinker will work really hard to think about which is better, A or B. Let's say A's net present value is $80 million and B's is $60 million. They'll do rigorous analysis to calculate the net present values and then say, "A is a much smarter option than B – it's better by $20 million NPV. At this point they'll think they have discharged their managerial obligations and made a sound decision. An integrative thinker says A is $80 million net present value, B is $60 million, and I don't like either alternative. I want $120 million. How could I combine the best of A with the best of B to come up with $120 million? They won't always reach their stretch goal. Maybe they'll try for $120 million and only get $90 million, but that's still better by $10 million. Integrative thinkers will most often be more successful than conventional thinkers who view their jobs differently – as choosing from among existing options rather than creating new options that do not exist. VB: Is the integrative thinker's propensity to "always search for creative resolution of tensions, rather than accept unpleasant trade-offs" the essence of creativity? Roger Martin: Yes. I think that is what the creative act is. That's absolutely right. VB: Is being aware of our personal knowledge system – stance, tools, and experiences – the key to developing our integrative thinking ability? Roger Martin: I think it is; I really do. Integrative thinkers are conscious of their personal knowledge system even if they don't use that term. There are integrative thinkers who have never read my book, The Opposable Mind, so we know you can develop your integrative thinking ability without necessarily knowing and understanding it in that way. Most integrative thinkers think very carefully about how they are thinking about a problem. They go 'meta' on the problem, if you will, and say, "How am I thinking about thinking?" rather than just thinking. And that's stance. Their experiences also influences how they think about a problem. Integrative thinkers are more contemplative about what they've done, such as asking themselves whether they have done it differently. What did they learn from the experience? Also, they find tools that are attractive, and consider it worth investing their time to learn rather than being content with only the most practical, simple tools. So yes, by having an understanding of your stance, tools, and experiences you will have a better chance of improving your personal knowledge system and becoming a better integrative thinker. VB: They consciously do this? Roger Martin: Do all of them consciously do it? No. But most do. VB: "The simplifying mind has no choice but to settle for trade-offs, also known as the best bad choice available." Are simplification and specialization into functional departments in a company almost sure to result in "business as usual" thinking? Roger Martin: No, I would not say so. I would say it's how you think about simplification and specialization. Simplification and specialization are a necessary part of the complexity of life and the complexity of knowledge in life. They're important and I don't argue against those two things. I argue against people thinking that simplification and specialization create no problems. Such thinking is a problem. You get better thinking when you say, "We have to simplify and we have to specialize in certain ways. What problems did those create and what things can we do to try to overcome and counteract the problems created by simplification and specialization?" With this approach you've got a fighting chance. VB: "Large organizations may not recognize generative reasoning [which uses abductive logic] as a legitimate mode of inquiry, but they depend on it for lasting competitive advantage." Would you explain? Roger Martin: It's a problem that is very much embedded in our educational system. To a great extent the modern world thinks that analytical thinking and reasoning is superior to dreaming about what the future might hold. So people get discouraged from using generative reasoning, and are looked down on when they use it. People who can analyze and crunch data are revered. It's a narrow-minded view of the world that is not helpful at all. It's a worry. I am increasingly worried about the STEM obsession in the United States and Canada – Science, Technology, Engineering and Math. When kids go to their guidance counselors they are often intimidated into thinking that if they're not following the STEM disciplines there's going to be no job for them. They're led to believe this is where all the future jobs are going to be, and that they should drop those useless subjects like art and philosophy and get on board with engineering, physics, and the sciences. It is really bad, narrow-minded advice, and I'm really concerned about it. VB: Perhaps this thinking is fueled by reports of engineers that are being graduated in China and India, for example, and so a certain degree of panic sets in about North America's competitiveness for the future. Roger Martin: Yes, and those numbers were made up. The numbers that are bandied around are 650 thousand engineers graduating per year in China, 325 thousand in India, and only 90 thousand in the United States. The conclusion is that we're rapidly falling behind. It turns out those numbers were made up. They came from a Fortune Magazine writer, and he was quoted over and over again. A group of researchers examined the merits of these statistics, and they finally went back to this writer and asked, "Where did you get those numbers?" He finally admitted that he'd made them up, but not before Bill Gates, President Bush, and others had cited them over and over again. It turns out that the only way you could get the 650 thousand in China would be if you counted as engineers people who had taken a two-week course in fixing small engines, for example. VB: Will the emphasis on the sciences have an impact on the type of thinking and reasoning that is valued in North America in the future. Roger Martin: We are not going to 'win' against China and India on the basis of out-producing them in purely scientifically trained people. Rather, we need people who can integrate across disciplines and have an understanding of how science interacts with humanity. You don't learn that in a STEM discipline. VB: How did your analogy between the opposable thumb and fingers and the opposable mind emerge? Roger Martin: It came from Bruce Headlam, a childhood friend of mine, who is now one of the editors at the New York Times. Last I checked he was editing the business section of the Monday paper. We were talking about the idea and he used this analogy. He said, "Aren't you talking about the moral equivalent of the opposable thumb?" That's when it hit me, and it seemed like the perfect metaphor. All credit goes to Bruce Headlam. VB: You say, "The interviews (of more than 50 leaders) were exciting for me, but unsettling." In what ways were they unsettling? It was unsettling in the sense that these leaders should have been proud of the way they thought, but they often were not. Being modest is a good thing in some sense, but it resulted in a bit of an odd feeling. VB: Did the comments by Bob Young, cofounder and former CEO of Red Hat and currently CEO of Lulu, especially surprise you because he had some novel ideas? Roger Martin: He was not one of the leaders who had that effect. He was much more willing to say, "Here's how I think and I know the way I think may seem to you to be weird but it's what I do." He certainly had intriguing and interesting ways to think. VB: It must have been a fascinating time to get inside the heads of the 50 leaders. Roger Martin: It was. Sometimes I still really miss it. I stopped doing these interviews when I finished the book, and I really enjoyed them. VB: Interviewing these leaders must have been a great learning opportunity for you. Roger Martin: Oh boy. Was it ever. VB: When referring to the integrative thinking course at Rotman School of Management you say, "…they learn that systematically reflecting on how they think is a powerful way to change how they think." Is this one of the key skills your students learn? Roger Martin: Yes. The idea is one of going 'meta' – to think about how I'm thinking rather than to just think. It's a term that Chris Argyris, one of my academic mentors, taught me. He's a Harvard Business School Professor Emeritus. He's about 80 now. The process of going 'meta' is to not just talk about the idea, but to talk about how we're talking about the idea as well. VB: Most people don't think about how they think, do they? They more or less blindly react based on habit. Roger Martin: Yes that's right. They just hop in and kind of think. VB: What are some of the questions still to be answered about the opposable mind? Roger Martin: One question is to what degree can we teach integrative thinking. We probably won't know how teachable integrative thinking is for another ten years as we work on methods to teach it. I know integrative thinking is teachable, but the question is how much can you teach it? Another question is what things in your upbringing make you more versus less conducive to integrative thinking. And then people always ask me about cultural differences. Other people say you should apply integrative thinking to other spheres. In the political sphere, for example, we're currently experimenting with the question of how young an age can you teach integrative thinking. We're now doing all sorts of work in high schools which is being very successful. I think 'no problem' is the answer to the question how young. VB: Are other business schools working on the question of how to teach the opposable mind? Roger Martin: Yes, more people are figuring out there's a problem with the way that we teach business. I find this very interesting. I started working in earnest on the question of how to teach the opposable mind in 1991 – sixteen years before the publication of The Opposable Mind. The first vector I went on was the notion that the problem is one of the disciplinary silos in businesses and in the business academy at universities – such as finance, sales, marketing, and operations. This led to the view that integrative thinking is the process of figuring out how to link marketing to manufacturing, or finance to operations. This meant that integrative thinking could be used to break down the silos. After probably 10 years of thinking along that vector I realized it was not the most productive. I concluded that innovative thinking is a meta skill which allows you to deal with clashing models. And those silos are only one tiny example of the clashing models that exist. People have clashing models about managing for the present, for the future, among stakeholders, across customer groupings, and countless other challenges. It is very interesting to me that almost everybody working on this problem seems to have go through the stage of thinking its about breaking down silos in an organization or across disciplines in a business program at a university. The disciplinary silos are only one tiny fractionary piece of the puzzle. There are a number of business schools now trying to break down their disciplinary silos. My thought is, 'Oh you're going to do that for 5 or 10 years, then you're going to figure out it's not a great idea, and finally you're going to go onto the next idea. I sometimes wonder why they don't pay more attention to what we have learned. It seems they want to do their own thing. VB: In some respects the opposable mind recognizes there is no single answer, doesn't it? Roger Martin: Yes. This is true. VB: Are successful design thinkers, who you talk about in The Design of Business, also comfortable using integrative thinking? 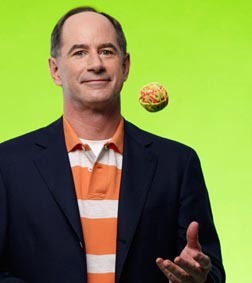 Roger Martin: I think of a design thinker as using a part of the integrative thinking toolbox. Sometimes I think of design thinking as double clicking on the generative reasoning box within integrative thinking. VB: Do you have any other advice on how to be a successful leader? Roger Martin: The single most important thing you can do in life is to see all models including your own as being flawed. You are better off if you go through life thinking that way and thinking that your job is to make better models – not to get to the perfect model and then stay there in a self-satisfied way. VB: This will ensure you focus on learning. Roger Martin: Yes, that is exactly right. VB: In The Responsibility Virus published in 2002 you talk abut avoiding the natural predisposition to 'screw up' the handling of responsibility, in The Opposable Mind published in 2007 about integrative thinking, and in The Design of Business published in 2009 about design thinking. Are you working on a book to be published in 2011 or 2012? Roger Martin: Yes, I am. It's coming out in May of 2011. It's a book called, Fixing the Game: Bubbles, Crashes and What Capitalism Can Learn from the NFL. In 2012, A.G. Lafley, the former Chair and CEO of Procter & Gamble, and I will be coming out with a book on strategy. VB: Are there any other questions I should have asked you? Roger Martin: No, that was very thorough. It was a good set of questions, and I feel very comfortable with the direction you've taken the interview. VB: You have been most generous of your time. Thank you. Integrative thinking is not the exclusive domain of brilliant leaders who are skilled at integrative thinking – the ability to keep in mind two opposing ideas and then reach a synthesis that contains elements of both but improves on them. Author Roger Martin's message is that all of us can consciously develop this as a habit for the way we think. "believe whatever models exist at the present moment do not represent reality; they are simply the best or only constructions yet made"
"believe conflicting models, styles, and approaches to problems are to be leveraged, not feared"
"believe better models exist that are not yet seen"
"believe not only does a better model exist, but that they are capable of bringing that better model from abstract hypothesis to concrete reality"
"are comfortable wading into complexity to ferret out a new and better model, confident they will emerge on the other side with the resolution they seek"
"give themselves the time to create a better model"
Roger Martin received his AB from Harvard College (Bachelor of Arts), with a concentration in Economics, in 1979 and his MBA from the Harvard Business School in 1981. He has served as Dean of the Rotman School of Management at the University of Toronto since September 1, 1998. He was appointed to a seven-year term beginning in September 1998 and re-appointed to a second term as dean effective July 2005. He is also a professor of Strategic Management at the Rotman School. Previously, Roger Martin spent 13 years as a Director of Monitor Company, a global strategy consulting firm based in Cambridge, Massachusetts, where he served as co-head of the firm for two years. His research work is in Integrative Thinking, Business Design, Corporate Social Responsibility and Country Competitiveness. In 2010, Roger Martin was named one of the 27 most influential designers in the world by Business Week. In 2009, The Times of London and Forbes.com ranked him as one of the 50 top management thinkers in the world. In 2007 he was named a Business Week 'B-School All-Star' for being one of the 10 most influential business professors in the world. Business Week also named him one of seven 'Innovation Gurus' in 2005, and in 2004 he won the Marshall McLuhan Visionary Leadership Award. He writes extensively on design and was a regular columnist for the BusinessWeek.com Innovation and Design Channel. He is also a regular contributor to Washington Post's On Leadership blog, the Financial Times' Judgment Call column, and Harvard Business Review's The Conversation blog. He has written nine Harvard Business Review articles. Dean Roger Martin is the author of The Design of Business: Why Design thinking is the Next Competitive Advantage (2009), The Opposable Mind: How Successful Leaders Win Through Integrative Thinking (2007), and The Responsibility Virus: How Control Freaks, Shrinking Violets-and the Rest of Us-Can Harness The Power of True Partnership (2002); and co-author with Mihnea Moldovean of Diaminds: Decoding the Mental Habits of Successful Thinkers (2009), and The Future of the MBA: Designing the Thinker of the Future (2008). His book, The Design of Business, was one of the six finalists for the 2010 George R. Terry Book Award. This award is presented to the single-authored book judged to have made the most outstanding contribution to the advancement of management knowledge with a contribution to management theory, conceptualization, research, or practice.